A postpartum doula is someone trained to take care of a mother and her newborn. My favorite part of this job is caring for the mom. My hospitality gifts come out and I enjoy caring for you as you recover. Your body went through the most intensive experience ever and you need time to heal and replenish your sleep and strength. Maybe it’s from my own personal experience of not having any help when I had my kids, but I am passionate about helping new moms. I will offer a set of helping hands and provide a compassionate and nonjudgmental presence during this period of adjustment. The mother is my priority and helping with baby helps mom to be more relaxed, confident and more rested, which allows mom to recover quicker. It’s common to feel unprepared to meet the challenges this part of the journey brings. It is my privilege to walk alongside you as you welcome your new baby into the family, providing gentle support, encouragement and education as you find your footing in your new role. For some mothers, they are bringing home baby into an already established family dynami c with other siblings. If that is your situation, I will be there to help with your recovery, tending to the baby so you can rest or care for your other children, all the while keeping things tidy when life seems chaotic. Sometimes, well ok all the time, it feels like we just need another set of hands. Let me be those extra hands and eyes! Whether you have questions about feedings, sleep or, “Is this normal?” or just want some company while you process all the changes that are going on, I’m here for you. My goal is to help you become self-reliant and confident in your skills as a mom! 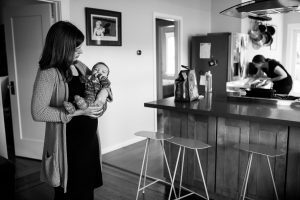 What does a typical postpartum doula shift include? Scheduling priority. Clients who have postpartum packages have first choice of my availability. Flexibility to book shorter visits. You can schedule shifts as short as 3 hours, as opposed to a 4-hour minimum, for à la carte clients. Many package clients love this option because it allows them to have more days of care. If you find yourself in need of just a little extra help so you can feel more confident caring for your little one (or sneak in a nap or a shower) this service is for you! I am often available on short notice, or you can schedule shifts ahead of time if you know there are some upcoming times when you’ll need some extra support. I also offer labor doula services and a childbirth class.